Chris Evert and Martina Navratilova. Serena Williams and Venus Williams. Pete Sampras and Andre Agassi. Andy Murray and Novak Djokovic. Rafael Nadal and Novak Djokovic. Roger Federer and Novak Djokovic. Open Era has seen a lot of rivalries but none could match the intensities and crowd pull of Roger Federer and Rafael Nadal. The two of them have set the hearts racing of a whole generation and converted a lot of passive tennis fans into die-hard Federer or Nadal fans. If you look at the stats, Nadal seems to have a clear upper hand with 6 grand slam final victories against the former Swiss No.1 compared to Federer's 3 grand slam final victories against the Spanish ace. But on the court, the story was very different with some nail-biting matches between the two stars. 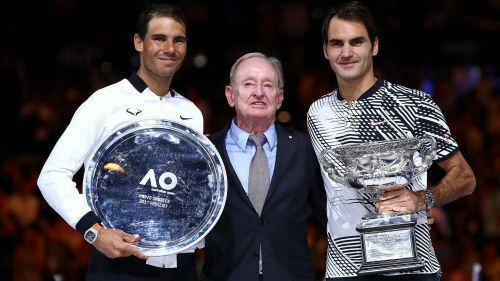 At the Rod Laver Arena, Federer and Nadal started the match with easy exchanges but Federer started faster and won the first set in 34 minutes. Nadal came back in the second set and was leading 4-0 before the blink of an eye and won the set quite easily. The Swiss ace took his revenge in the third set as he led 3-0 and wrapped up the set 6-1. The 6-1 drubbing didn't affect the Spanish star's mental strength as he came back and won the fourth set 6-3. In the fifth set, Federer was trailing 1-3 but came back firing on all cylinders and won straight five games to win his 18th grand slam title, his first since the 2012 Wimbledon title. Also, he became the first 17th seed player to win a grand slam since Pete Sampras' 2002 US Open victory.